This letter, sound and syllable assessment bundle is an easy to use assessment, complete with a sheet of suggested uses. This pack also comes with a graph so that students can easily see their own progress. 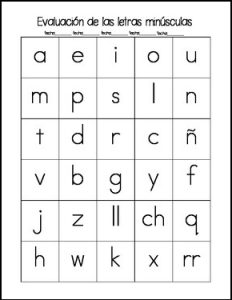 This bundle can be used in conjunction with the Evaluacion de letras y silabas: Teacher tracking forms, which can be found on my TPT store.